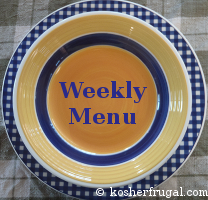 Kosherfrugal.com - Frugal Living in Israel: Weekly Menu! This week I am running dangerously low on all sorts of staples, since I never really did grocery shopping or a health food store trip last week! Supper: Fried rice (with soy sauce, vegetables (mostly cabbage) and egg) Not sure if we need more than just this one food. If yes, well. Really not sure what it would be. Lunch: Red lentil soup, whole wheat biscuits, cabbage salad? I am actually planning a freezer-take-out Shabbat this week, so we'll just need to buy some fresh fruits and vegetables and milk to take us through to next week!